It's early days but the good start to the second quarter continued to gather steam across the region yesterday. The boost came from good manufacturing data out of China and the United States on Monday that continued to lift risk appetites. Growing optimism over US-China trade talks and cheap borrowing costs were also a boon to investors and helped to dispel gloom over slowing global growth. FXTM chief market strategist Hussein Sayed noted that investors have "found fresh reasons to continue buying risk assets after a robust first-quarter performance". The Straits Times Index (STI) rose 29.27 points, or 0.9 per cent, to 3,279.78 - its highest close this year. 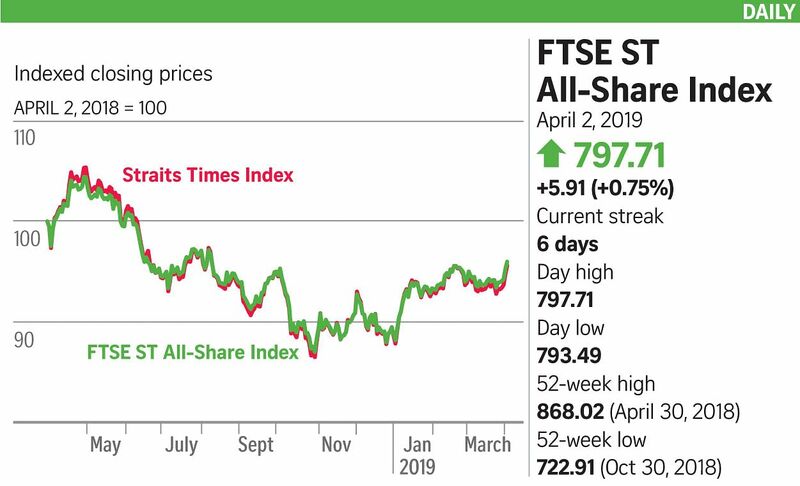 UOB Kay Hian's vice-president of equities and financial products Brandon Leu said that as the STI "nears its 3,300 resistance, we expect to see some profit-taking, especially after the recent run-up from 3,156". Elsewhere in Asia, Australia, South Korea, China, Hong Kong and Malaysia closed higher, but Japan crept lower on profit-taking. Trading here clocked in at 925.28 million securities worth $1.16 billion, with gainers outnumbering losers 227 to 176. Tritech Group was the most active, with 43.6 million shares done, likely due to speculative trading. The usually thinly traded counter added 26.2 per cent to 5.3 cents. The 23 STI constituents that ended the day in the black included Genting Singapore, which was the index's most traded. The casino operator added 0.9 per cent to $1.06, with 34 million shares changing hands. DBS added 1.9 per cent to $26.07, while OCBC Bank put on 1.3 per cent to $11.35 and United Overseas Bank rose 1.3 per cent to $25.74. Clearbridge Health surged 14.2 per cent to 16.9 cents after PhillipCapital initiated coverage on the stock with a "buy" recommendation and a target price of 28 cents. Despite yesterday's robust gains, the share is still down 1.2 per cent this year. Recent weeks have seen Singapore real estate investment trusts (S-Reits) rally on their defensive nature and the low interest rate environment, outperforming the STI in the first quarter. Credit Suisse South-east Asia research head Kum Soek Ching said: "Even after the strong performance, we believe most S-Reit valuations can be justified by the lower cost of equity as interest rates fall. Investors may want to add to their positions when there is weakness for better risk-reward." The bank sees improving demand-supply dynamics in property markets or overseas acquisitions supporting a 1 per cent to 4 per cent distribution per unit growth for S-Reits in the next two years.